again photos are taken in beautiful Heidelberg. Gorgeous look ! Love your cap toe shoes ! Zara rocks! You look so chic! Gorgeous! I love the accessories! Such as cool and chic outfit!, loving the shoes!! 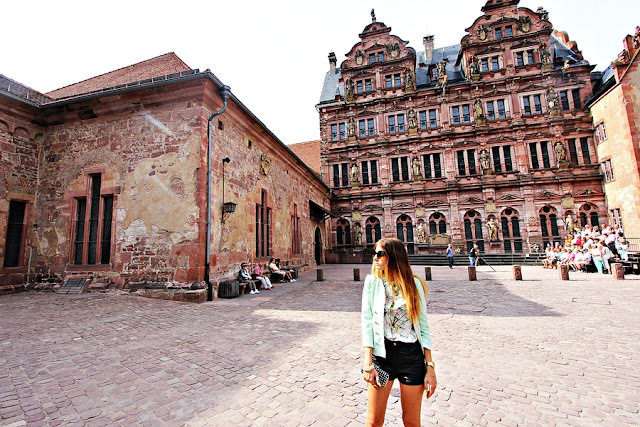 I love Heidelberg, it´s really a great city, but quite difficult to walk with heels there because of the cobblestones. Lovely photos!!! The sunglasses are...OMG...amazing!!! Love your mint blazer Isabella:))! Gorgeous! Thank you so much for visiting my blog! I'm following you now on GFC...Follower #1917 ;)! Have a great day my friend! all you wore just so gorgeous dear! i thought this was out of a fashion magazine.. you look fantastic! Love the outfit as usual and the shoes I want ! Gorgeous!!!!!!!!! We love the clutch and the blazer!!!! Really amazing! Like all your clothes...! Love it! Wow. You look amazing. So nice pics and style. And nice blog. Awesome stylisation, very good pictures, you are gorgeous! You threw everything together nicely! i just love your shoes! Wonderful mix of lady like and rock! Love it! So sad that you have to leave Germany! You look great! I love the shorts! I love your blog posts!! You always have such beautiful pictures, love your jacket! !